Thank you thank you thank you thank youuuu~~~!! Sure! Please send the points through the commission widget on my main page under "Adoptables - 150 points"
omg I want #3 so bad!!!!!!!! if you want you can have any to all of my open adopts!!!! I also do many different types of customs! ahh i've got my eye on 2 but before i decide to buy, do you have any more information about these little guys? ;v; like what they eat, how big they are, etc.? Bottle Birdies live in glass bottles the size of the palm of your hand. During the day they may wander out of the bottle but at night they always return back to the bottle and give off a little glow. 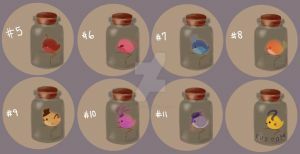 Bottle Birdies like to collect objects in their bottle homes; the objects collected are based on its personality. Bottle birdies who come with an empty bottle are recently born and adapt quicker to their new homes and owners. They love to sing - they will remember the first song they hear and modify it so that it becomes their own special song. Their main meal is crystal sugar. They also love to socialize and visit others, but it is rare to see Bottle Birdies share a bottle for a home. oh my goodness. ;v;; i dare say i've fallen in love with these, thank you! Thank you for adopting! Please send the points through the commission widget on my main page under "Adoptables - 150 points"